We have so much leftovers from Easter dinner, but we are low on fruits so I am contemplating some grocery shopping. I am also out of nori (seaweed) and had to use fruit leather for the whiskers. Of all our traditional Japaneses bento boxes, I have come to love the Monbento box the most and if I had to choose only one traditional bento box, this would be it. It can be used either as a single or a double tiered box and I love the durability and feel of the plastic. 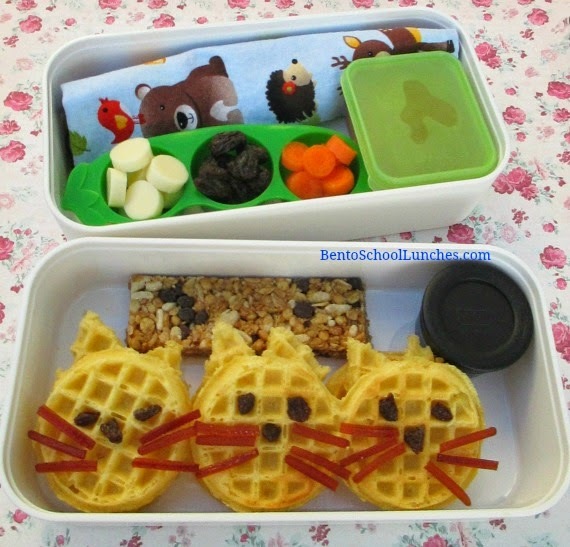 Top tier: Mini waffles( stacked) with raisin pieces for facial features and fruit leather for whiskers, maple syrup in a small Monbento sauce container and a granola bar. Bottom tier: String cheese slices, raisins and baby carrot slices in a pea pod container. Organic apple sauce in mini-dipper and a spoon wrapped in cloth napkin. This lunch is packed in our Monbento box.